Only recently I reviewed a recording of the first six sonatas from this same op. 2 by the ensemble Il Rossignolo. I'm not going to repeat here all the information about the composer and these sonatas given there. 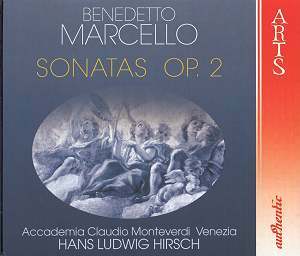 It is relevant, though, to refer here to the popularity of this collection of sonatas, which is reflected by the fact that during Marcello's lifetime no less than three different editions of his op. 2 were published. The first was printed by Giuseppe Sala in Venice in 1712. It was followed by the edition of Etienne Roger, which appeared in Amsterdam in 1715. Like the original edition it was scored for recorder and basso continuo. As late as 1730 another edition was published, this time in London by John Walsh. At that time the transverse flute gained in popularity at the expense of the recorder, and therefore in Walsh's edition the sonatas were transposed to keys which made them more comfortable for the flute. In this recording the sonatas are played on recorder, transverse flute and violin. All three editions have been used, and the respective numbers in the editions are given in the tracklist. Sala and Roger use the same order, but in Walsh's edition the sonatas are printed in a different order. In the tracklist above I have corrected one error in the tracklist of the discs: the first sonata of disc one is not number 7, but number 8. I also have given the original keys, as the discs only give the keys in which the sonatas are played here. The recorder uses the original keys, the violin and the transverse flute are playing transpositions - the violin keeps the original key once. Although Marcello wrote these sonatas for the recorder there is no objection against playing them on other instruments, even transposed to a different key. That was common practice in the 18th century, and a publication like John Walsh's is proof of that. Composers themselves were often only suggesting a specific instrument, and there are many collections of sonatas of Marcello's time which leave the choice of instrument to the performer. There is also much variety in the scoring of the basso continuo here. Sometimes only a harpsichord is used, mostly a combination of cello and lute or organ. In one sonata the solo instrument (the violin) is supported by cello only. The variety in the scoring of the basso continuo is one of the positive aspects of this recording. Another is the lively playing of all participants - this performance is anything but boring and is testimony to the quality of Marcello's sonatas. Unfortunately there are too many aspects which hold me back from recommending this recording. First of all there are some technical problems. Everyone knows most recordings are the result of cutting and pasting, but the listener should not hear that. Here, regrettably, the edits are clearly audible in several tracks. There is also something strange about the acoustic, which seems to change from one track to another. As far as the presentation is concerned I find it rather inconvenient that every sonata gets just one track and that it is impossible to search for a specific movement from a sonata. And the decision to give only the key in which the sonata is played on these discs makes a comparison with other recordings very difficult. The listener has the right to know what the original key is. Also strange is that the booklet mentions two players who play the 'flute', but: which flute? The recorder or the transverse flute? It is totally unclear which player is playing which flute. Despite the positive things said about the interpretation before I am not impressed by it as a whole. Sure, the recorder's dynamic range is limited but more dynamic contrasts are possible than the player - whoever he or she may be - produces here. Martin Noferi in Il Rossignolo's recording makes that abundantly clear. The playing of the violinist is unconvincing, sometimes outright painful. In some movements the intonation is problematic, and otherwise one doesn't get the impression he is above the material. Over the years I have heard violinists in fringe concerts in the Holland Festival Early Music who played better than Luigi Rovighi. The performances on the transverse flute are the most satisfying part of this recording. What is a feature of this performance as a whole is a lack of differentiation in the way the notes are played: there are too few dynamic shades, too little variety in the length of equal notes and not enough breathing spaces. In short: despite the positive aspects of this interpretation the recording as a whole is disappointing. The performance shows its age - and there is nothing wrong about that -, but I can't see a reason to release it, and the technical shortcomings are definitely unacceptable.